We're brewing up a storm! It's official! We are super excited to announce that Home Make It is the presenting partner of the Melbourne Salami Festa this year. Follow the link to check out the full program for 2015.Tickets go on sale on the 15th September, 2015, ensure to book your tickets so you don't miss out! And if you think you've made this year's winning salami then be sure to get your applications in! Applications close on the 4th October, 2015. Follow the link here for all the application details. This year there will be an Amateur Entry and Professional Entry. We can hardly wait to see who will win the prized "Homemade Salami" award this year! 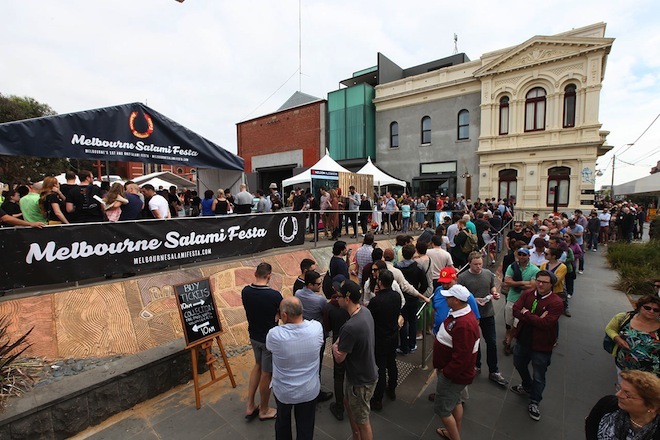 So lock-in the Melbourne Salami Festa date in your diaries everyone! It's all happening on Sunday 18th October, 2015. We are thrilled to have been part of the Rachel Khoo's Kitchen Notebook Melbourne series now showing on SBS, Thursdays at 8pm. Rachel visited with Frank Bovezza and family to join in on the fun at their annual passata making day. Nonna Rosa Bovezza also shares her spinach and ricotta ravioli with passata recipe and shows how to make it the "old fashion way." Watch the show, season 1 episode 6 on SBS on Demand if you missed it and have a go at this simple and delicious spinach and ricotta ravioli recipe. Dust off your pasta machine and pasta cutters or pick some up online or in store. Enjoy! We have been brewing up a storm in the last few weeks, with our Intro to All Grain courses being recently held at our Reservoir and Clayton stores. The interested students came along, had a hands on view of just how easy it is to take the jump over to all grain brewing. I’ve already spotted a few of these students in store, excitedly gearing up for their first mash. Great to see! A while back we had a brew day with the Merri Masher Brew Club and I decided to test the version hopped with Amarillo hops. I give it a huge thumbs up, the smooth chocolate malts with the hoppy touch really warmed me up. Although the 8% ABV might have helped a touch. We had the ever popular Wyeast nestle into our fridges at the end of last week, right next to our White labs range. So whether you’re a Wyeast or White Labs brewer, we have you covered. Also, note the White Labs have started filtering in, in it’s new "pure pitch" packaging. With father’s day coming up, I have a few ideas for a gift that Dad will really love. For a short time we have dropped the prices off our range of Beer Recipe Kits a whole 30%, and with over 15 types of beer recipes to choose from it’s a steal at that price! And if that father in your life is an all grain brewing kind of Dad, how about you go all out and get him a bulk grain sack? We also have good stocks of the SS Brewtech range in store. I’m sure Dad would be forever grateful if he received one of these shiny fermenters or boil kettles. Due to popular demand, we are stocking the SICO Vacuum Sealing Machines again! Made in Italy and of the highest quality domestic machines. If you have made salami this winter, then no doubt you will have been religiously checking them to see if they're ready. Are they feeling firm? Have they lost 30% of their original weight? Are they smelling like salami? You've cut one open and it looks ready to go! What do you do next? The best way to store your cured meats made this winter is to vacuum seal them. That's if you don't succumb to the temptation to eat them all at once of course. Vacuum sealing your salami in bags and placing them in the fridge will give salumi maximum shelf life. The process of vacuum sealing is even more important to do with your homemade sausages. This will keep them fresh and moist, even when stored in the freezer. Also in store is a massive range of vacuum sealing bags. But, we've had to make room for them on our shelves, so we're offering 40% off all ELEGEN Vacuum Sealing Machines until stock runs out. These are also Italian made and also of the highest quality. These are massive savings! A vacuum sealing machine will make the perfect gift this Father's Day if your dad has made salami and/or sausages this winter. Our Gift Cards are also popular gift ideas for the fussy Father. They can also be used to purchase any of our Food and Beverage Courses. Spoil dad this Father's Day with his very own Homebrew Equipment Kit and Recipe kit. We have an extensive range of Recipe Kits to choose from. For more unique Father's Day Gift Ideas, check out our ONLINE store for inspiration. We have now released new dates for our Sausage Making Courses at both our Reservoir and Clayton stores. James Mele will teach you everything you need to know to make fresh, tasty, healthy sausages all year round. Book ONLINE now to secure your place. Rose Creek Estate, is in the heart of suburban East Keilor. It's been described as "Tuscany in East Keilor"and really needs to be seen to be believed! The owners, Tony and Lina Siciliano are opening their garden to the public this Sunday. An olive grove, winery, and magnificent garden hidden away behind a suburban home. Rose Creek Estate has won many awards for it's fine olive oil and wines. There will be wine and olive oil and olives from the estate for tastings. There will be coffee, music, oven baked bread and pizza. Watch the baby chickens, guinea fouls and peacock. Accompany Tony and Lina on a tour around the beautiful gardens, olive grove and vineyard. Be sure to come along and say hello to the crew from Home Make It. We'll be there with a small pop up store with our specialty products include equipment to preserve olives, olive oil, make homemade vinegar, arancini, roast chestnuts and much more. Click link below to check out this week's Specials. You'll be sure to find more Father's Day gift ideas too. On behalf of all the team, I would like to wish all the dad's out there a very happy Father's Day! "Age is something that doesn't matter, unless you are a cheese." With the salami making season almost over, our homemade food and beverage enthusiasts will be contemplating their next home crafted food challenge. We have just the idea! How about trying your hand at cheese making? It really is something we can all do at home. The process has been made even easier with this fantastic range of homemade Cheese Kits from Epicurean. Whether it's Ricotta, Feta, Mozzarella, Blue Vein or Camembert cheese you love, there's a kit available for every style. Be inspired by Brenda from 13 Acres as she has a go at making her very own Camembert cheese at home, following her training and participation in our Camembert cheese making course. Brenda has also written a lovely blog capturing the step by step process of her cheese making adventure. You can watch her video by clicking here. Below are some images from Brenda's 13 Acres blog. We hope you'll love'em! And yes, it really is that easy! We are also in the process of expanding our range of cheese making equipment and supplies to keep up with demand. So, watch this space! New products arriving in our stores in the next fortnight. Click here to check out our current range ONLINE. We have now released new dates for our Sausage Making Courses at both our Reservoir and Clayton stores. James Mele will teach you everything you need to know to make fresh, tasty, healthy sausages all year round. Book ONLINE. Cade will be launching his very own introduction to All Grain Home Brewing Course in August at both the Reservoir and Clayton stores. Learn all about equipment needed, grains, hops, yeast, how to mill, mash and all maturation/fermentation and bottling techniques to make your favourite styles of grain beers. Book ONLINE. Spoil dad this Father's Day with a Gift Card from Home Make It. Our Gift Cards can also be used to purchase any of our Food and Beverage Courses. What dad would not want one of these! 5lt Copper Still with condenser and thermometer. Get dad busy in the kitchen with our Sausage and Salami Making Equipment Kits. We have a massive range of Salami and Sausage Recipe Kits to compliment the Equipment Kit. Every man cave must have one of these! We have a huge range of homebrew kits and recipe kits. Come along and see for yourselves one of Melbourne's hidden treasures! Rose Creek Estate, in the heart of suburban East Keilor is opening its garden to the public. Rose Creek Estate has been described as "Tuscany in East Keilor". You truly have to see it, to believe it! An olive grove, winery, and magnificent garden hidden away behind a suburban home. There will be wine and olive oil and olives from the estate, taste the latest releases, the Victorian Herb Society will be there, coffee, music, oven baked bread. Stephanie Alexander's Kitchen Garden Foundation will cook delicious wood-fired pizza. Watch the baby chickens, guinea fouls and peacock and accompany a tour around the beautiful gardens. Our Home Make It team will be there too with a pop-up store of all our popular and unique equipment and supplies, including our new range of Arancini Moulds. Hope you have all been tucking into some nice smoky porters and roasty stouts to ward this Winter weather off. We have been all kinds of busy at Home Make It! If you remember back to last newsletter we had the gents from the Merri Mashers Brew Club over to brew up an all Gladfield malt Baltic Porter on our 100 litre brew system at Clayton. We split the end product up and Reservoir and Clayton stores each have had a fermenter bubbling away since. At Reservoir we dry hopped it with Amarillo hops, and for Clayton we went for American oak chips. I bottled both this week and after a sneaky "quality assurance" taste I must say WOW! I cannot wait a few months for this to be ready. Last Saturday, we pulled up to the Royal Exhibition Building for the Top Shelf boutique drinks festival. We sidled up to the "Tasting Den" area to give a short presentation on Home Brew and how it’s changed over the years. We even gave the punters a few tasters of some quality Home Brew and got the thumbs up all round. We are also happy to announce that the widely regarded Wyeast yeast range have arrived in our warehouse. Many brewers say they’re either a White Labs brewer or a Wyeast fan. Now we have both covered. With Father's day coming up, we have cooked up a nice special for our Beer recipe kits. With just under 20 different recipes, lovely packaging and ingredients including malt extract, yeast, brewing sugar/malt mix and even hops, these will be the perfect present for Dads on Father’s day. These will be on SALE for an amazing 30% off the whole range! So get in quick and tick that Father’s day present off your list. Inspector Montalbano - "How do you say...OMG, how good are these!" in Sicilian? Hot off the press! Our Italian-made arancini maker moulds have just arrived in-stores! Ever wondered how Italians make the perfect arancini with seemingly no effort at all? Well, Italy's best kept food secret is now out! Now we can all make the perfectly shaped and superbly flavoured arancini; with a just little bit of time, the right ingredients and an arancini maker mould! You can even choose between round shaped moulds and pyramid shaped moulds. Check out this You Tube clip by our Italian supplier and you'll see just how easy it really is. To make the risotto, add the rice to the heated oil in a large saute pan, stirring quickly for one or two minutes to coat the rice in oil. Stir in the white wine until evaporated. With the heat on medium high, begin adding the chicken stock a little at a time, stirring continiously, until all the stock is finished and the rice is cooked (al dente). Add salt to taste. Remove from heat and set aside to cool. Flatten out on a large plate to cool. Then add an egg to the risotto and mix in. Leave in the fridge for a couple of hours to cool, or even overnight. To make the arancini, follow the process as shown in the You Tube clip using your Arancini Mould. Fill with mould with rice, bolognese sauce, cheese and more rice to finish. To coat the arancini, remove the arancini from the moulds. Roll in flour and then roll them in the beaten egg and then roll in breadcrumbs. Optional to add Parmesan cheese to the breadcrumbs. To cook the arancini, heat the oil in a deep fryer or pan until hot. Add the arancini, turning quickly until brown all over. The arancini will cook quickly. To serve the arancini, reheat them in the oven on baking paper for 5 to 10 minutes at 180°C. I would like to thank the Societa`Isole Eolie Club in Melbourne for inviting us to join them for their 2015 Cultural Cooking demonstration on the 12th July, 2015. We all had a great day, with Frank thoroughly enjoying himself (and all the attention) for the salami making demonstration. We learnt heaps during Letizia's tuma and ricotta cheese making demonstration and can't wait to try out Guilia's recipe for conciglie ripieni. We met heaps of new people and would like to welcome all the new subscribers from the event to our newsletter/blog. We look forward to keeping you all up to date with news from the Home Make It team, new events, recipes, products, courses and more. Congratulations to Francis Maurici, who won the raffle for our Sausage & Salami Making Equipment Kit and the Hot Italian Recipe Kit. Congratulations to Tina Zampaglione, winner of our Stainless Steel Table BBQ. This week we had a special brew session at our Clayton store using our bespoke 100L Italian nano brew system. I enlisted the assistance of Justin, Shannon and Mattias from the Merri Mashers Brew Club to put the nano brew system through its paces. We tested it out with a HUGE beer and Gladfield malt helped us out with some malts to put together the Baltic Porter recipe designed by Justin. If all goes to plan it will weigh in at a whopping 8.5%! After much milling, mashing, sparging and some good old fashioned home brew Macguyver improvisation we hit all our targets, then divided the wort into four and each took some home to continue the brewing process. We will all use different hops and yeast to see how we can all make a personal variation on the same beer. We will be fermenting one in each of the Home Make It stores also. I can’t wait for the tasting session! We are also heading towards our Intro to All Grain Brewing courses in August. We will be doing one at our Reservoir store on August 15th and our Clayton store on August 22nd. So if you’re interested in stepping up to all grain brewing, come along and learn how to get started. Call us in-store or book online to reserve your spot. Limited places, so get in quick. Should be loads of fun! On a stock front, we still have really good stocks over all brewing areas. White Labs liquid yeast are sitting fresh in our fridges alongside our extensive hops range. Our grain shelves are full; from small bags of speciality grains up to our 25kg full sacks of base grain. Don’t forget we stock the shiny SS Brewtech range also. These boil kettles and brew bucket fermenters make the brew day a lot easier. Come along and see me at Top Shelf: Boutique Drinks Festival coming up on Saturday 8th and Sunday 9th of August. Catch me in the Tasting Den on the Saturday at 1pm, doing an Introduction to Home Brew presentation. Get your tickets to the Top Shelf Festival online. Come and see Home Make It at the Rose Creek Estate Open Garden on Sunday 30th August, 2015 between 11am and 5.00pm. Rose Creek Estate has been described as "Tuscany in East Keilor". It's a vineyard and olive grove right in the heart of East Keilor (2 Craig Street, East Keilor). There will be food, pizza, music and dancing. Join Tony and Lina Siciliano for a tour of the extensive gardens and vineyard along with a trek along the olive groves. Shop and eat until your hearts content! Entry: $5.00 per person. All proceeds from Rose Creek Open Garden are being donated to the Stephanie Alexander Kitchen Garden Foundation, supporting pleasurable food education. Click on our sale banner above for this week's specials. Included in this week's specials are 30% off selected salumi casings and netting and 40% off Elegen Vacuum Sealing Machings. I think we'll have to get in touch with Nonna Poala to promote our arancini moulds. I was so sure I would find a You Tube clip with Nonna making arancini. Maybe next week :) I did find a great video clip of Nonna Poala preparing her olives and I was convinced that we were going to get an education on preserving olives, however it was sadly high-jacked by her son Greg wanting her to try the new Cadbury Vegemite chocolate. Enjoy!